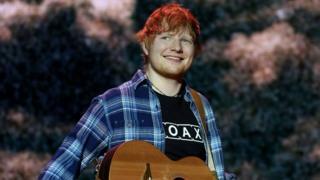 "We're achieving exactly what Ed wanted, which is 'we want you to come in and pay this [fixed] price,'" said Stuart Galbraith of concert promoters Kilimanjaro Live.A further 500 tickets are going to be cancelled this week, ahead of the first date of the tour at Manchester's Etihad Stadium, he added. In addition, the on-sale date was a Saturday - rather than the traditional Friday - to make sure genuine fans had the greatest possible chance of being online.Sheeran also partnered with Twickets - a site which allows fans to swap tickets at face value or less, in order to protect fans from the "unethical practices" of touts.Galbraith negotiated with ticket resellers Get Me In, Seatwave and StubHub to make sure they wouldn't list tickets for the tour - in some cases, using the threat of prosecution under the Consumer Rights Act to reinforce his point. "The only agency which listed against our wishes and ignored all our correspondence was Viagogo," said Galbraith. Once tickets had been sold, the promoters "very laboriously" went through all the transactions and "identified known touts and multiple purchases". Those tickets, and any listed on Viagogo were immediately invalidated. "We refunded everybody even though we know they're power sellers and touts, so we can't be accused of taking double income off a single ticket," said Galbraith.When the tour launches, anyone who turns up unaware their ticket has been cancelled will be met be a customer care team, he added. "We'll have teams that say, 'your ticket is invalid' and it'll be stamped invalid. That's important because it will enable them to go back to Viagogo and claim a refund. "What we'll also then do is... send them to the next window and sell them a ticket at face value." He added: "We genuinely hope we turn away as few people as possible. Because at the end of the day, even the people who've bought in the secondary market, as far as Ed is concerned, are still his [fans]. "Sheeran's ticketing system is not a first - Glastonbury and the West End musical Hamilton operate similar policies - but no-one has attempted it for a large-scale tour before.It was conceived with the help of the FanFair Alliance, which lobbies against the "black market" in concert tickets, and has already been mimicked by the Arctic Monkeys for their upcoming UK tour.Their manager, Ian McAndrew, said he and the band had grown tired of fans being "misled, confused and, I believe, fraudulently led to spend large sums of money on tickets, even when tickets are actually still available" at face value.In total, the band sold 190,000 tickets with only a small percentage appearing on secondary resale sites. Again, only Viagogo refused a request not to list the tickets.The Swiss-based site is currently facing legal action over its failure to comply with consumer protection laws.